Box arts are profiled from a variety of angles using high quality scans and with the intention of acknowledging the men and women who have played such a major role in shaping our gaming experiences. From 1988 until 1994 Tom Dubois would be responsible for a plethora of Konami’s highest profile box arts in what is arguably the companies golden era in video game development. To start the 1990’s Tom would design covers for three of Konami’s most cherished IPs, Castlevania, Metal Gear and Contra. Castlevania III: Dracula’s Curse (1990) saw the artist arguably depict the series for the first time in a light befitting of the game’s gothic/ fantasy roots, over and against the two prequel’s hammy covers. He would also lay claim to being the first and only US artist to produce Castlevania series box arts. Snake’s Revenge (1990) would be Tom’s first high profile game for Konami’s subsidiary publisher, Ultra Games. 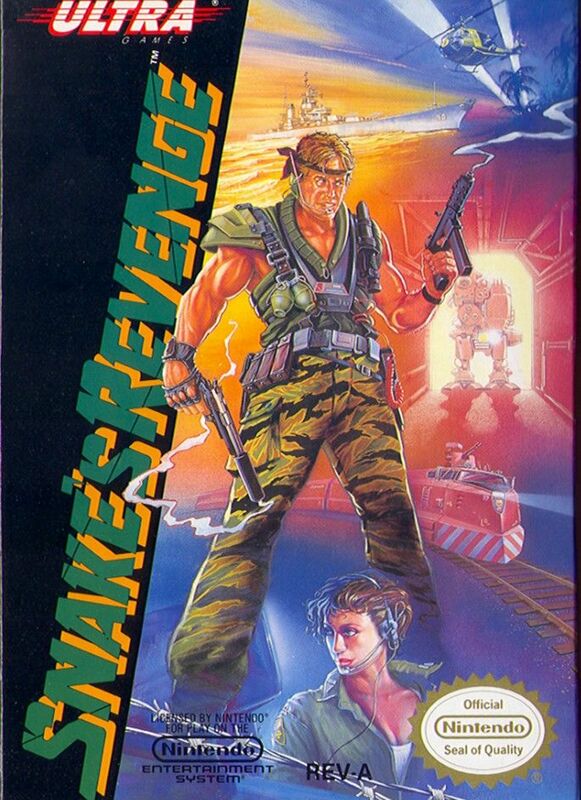 The box art would feature protagonist Snake and much like the Japanese debut cover, would depict Michael Biehn’s Kyle Reese from the first Terminator movie. The cover would also be an early and classic example of the rich and explosive colour palette Tom fearlessly used. From 1991 - 1993 Tom would be responsible for some of the most iconic and beloved covers of the 16 bit era. 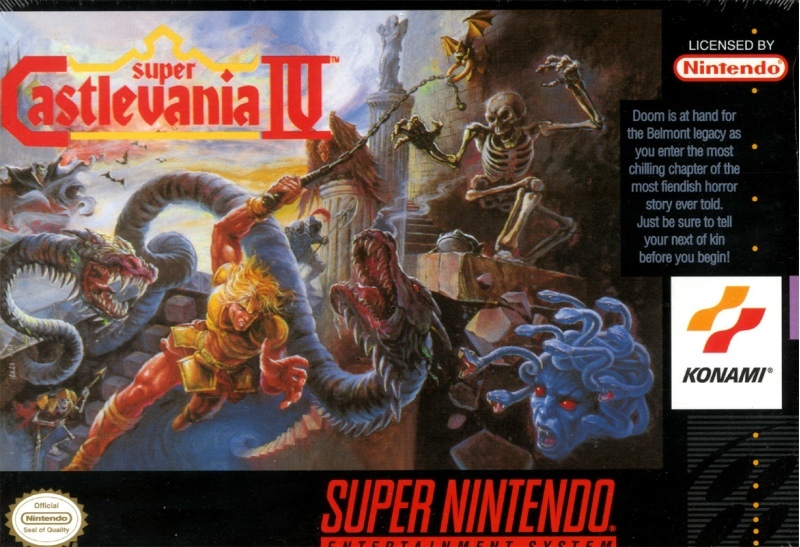 Box arts such as Super Castlevania IV (1991), Contra III: The Alien Wars, Axelay, Cybernator (all 1992) and Sunset Riders (1993; the artists favourite cover) would naturally standout and wrestle above their European and Japanese counterparts. >The Adventures of Bayou Billy (EU/ NA) NES. >Blades of Steel (EU/ NA) Amiga, Commodore 64, DOS, Game Boy, NES. >Defender of the Crown (NA) NES. >Silent Service (EU/ NA) NES. >Castlevania III: Dracula’s Curse (EU/ NA) NES. >MetalMech: Man & Machine (NA) NES. >Nemesis (EU/ NA) Game Boy. >Snake’s Revenge (EU/ NA) NES. >Super C (worldwide) Amiga, DOS, Famicom/ NES. >Top Gun: The Second Mission (worldwide) Famicom/ NES. >Bill Elliot’s NASCAR challenge (NA) NES. >Castlevania II: Belmont’s Revenge (EU/ NA) Game Boy. >Double Dribble: 5 on 5 (NA) Game Boy. >The Lone Ranger (NA) NES. >Operation C (EU/ NA) Game Boy. >Skate or Die: Bad n’ Rad (NA) Game Boy. >Super Castlevania IV (EU/ NA) SNES. >Contra III: The Alien Wars (NA) Game Boy, SNES. >The Legend of the Mystical Ninja (EU/ NA) SNES. >Monster in my Pocket (EU/ NA) NES. >Turtles IV: Turtles in Time (EU/ NA) SNES. >Turtles: The Hyperstone Heist (EU/ NA) Genesis/ Mega Drive. >Lethal Enforcers (worldwide) Genesis, Mega CD/ Sega CD, SNES. >Raging Fighter (EU/ NA) Game Boy. >Rocket Knight Adventures (EU/ NA) Genesis/ Mega Drive. >Sunset Riders (EU/ NA) Genesis/ Mega Drive, SNES. >Teenage Mutant Ninja Turtles III: Radical Rescue (EU/ NA) Game Boy. 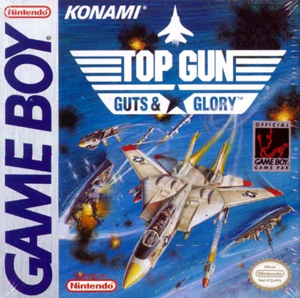 >Top Gun: Guts and Glory (EU/ NA) Game Boy. >Double Dribble: The Playoff Edition (NA/ JP) Genesis/ Mega Drive. >Lethal Enforcers II: Gun Fighters (EU /NA) Genesis/ Mega Drive, Mega CD/ Sega CD. Tom Dubois box art catalogue. Formally art trained at the American Academy of Art, Chicago in the late 1970’s, it would be 1988 when Tom got his break into the video game industry. A family member of his working with a local ad agency, Michael Meyers, was asked whether he knew any illustrators in town who could design ‘exaggerated and animated type characters’. Tom’s name was put forward and after submitting samples, he got the job. His first assignment would be the artwork for a comic book ad that Konami wanted published. This was late Friday night and the deadline was due that Monday morning. Tom from the very beginning would get a tough lesson in how publishers of the 1980’s tended to treat box artists: always rushed and always pressured to deliver. Snake’s Revenge| Ultra Games| 1990| The first and only western artist to design a cover for the Metal Gear series. Snake’s face would be a direct lift off the original game’s box art. Blades of Steel| Konami|1988| The artist’s first box art and one of his most widely used. The Japanese original would be a direct influence. Pleased with the results, Konami and Michael Meyers kept the work coming. Tom would do further ad work such as for Metal Gear, NES (1988) before taking on his first box art for Blades of Steel (1988). Taking inspiration from the original Japanese box art (Famicom Disk System), Tom would better Konami of Japan’s version by adding spade-loads of character through his trademark facial expressions. 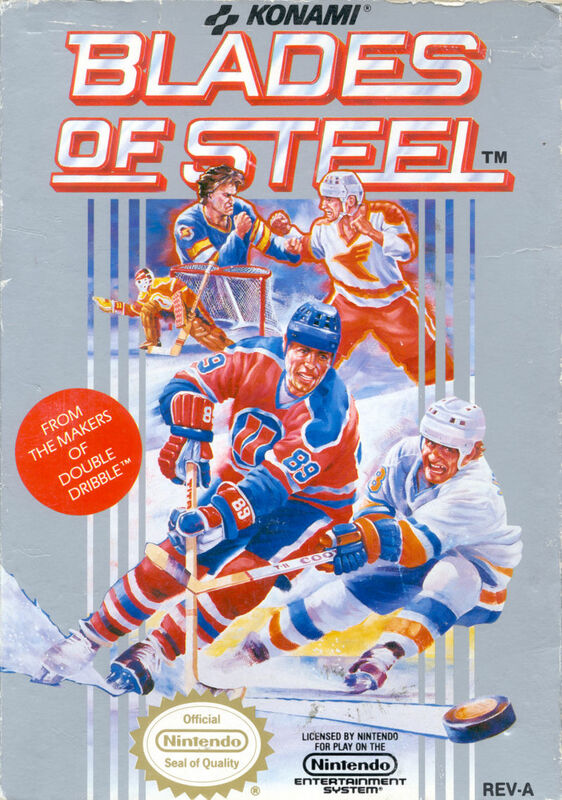 Blades of Steel would interestingly be one of only two box arts - the other being Super C - to be used on America’s home computers (Amiga, Commodore 64, DOS), with all subsequent covers being console/ handheld exclusives. 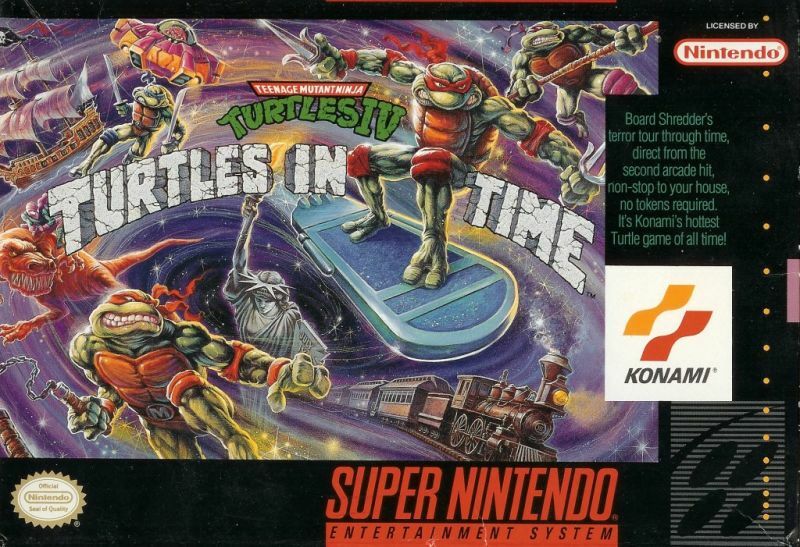 Turtles IV: Turtles in Time| Konami| 1992. His characterisation of the Teenage Mutant Ninja Turtles in Turtles IV: Turtles in Time (1992) would be another highpoint. Stripping them of their goofy (but still great) 80’s cartoon look, Tom would depict them with a new edge that would see inspiration from the artist’s personal heroes, comic book alumni Sienkiewicz and Bisley. Worth noting is also 1993’s Rocket Knight Adventure. It would be a character designed by Tom, and one that would interestingly be reinterpreted by a Japanese artist with few changes made when released in Asia. Tom’s final box art would be Lethal Enforcers II: Gun Fighters (1994) at which point Konami of America changed ad agencies and the work dried up. Post Konami, the artist would carry on illustrating for the likes of Disney, creating limited edition prints from their film catalogue, before working with a fine art publisher creating biblically themed prints. Today, Tom is still working within the Christian community illustrating for faith journal, Good News. An artist of immeasurable talent, who helped define one of the great era’s of video gaming; Tom’s edgy and expressive art was, and still is, a reminder of the ingrained influence great box art can have. Super Castlevania IV| Konami| 1991| Probably the artists most fondly remembered box art and one of many he’d do for the Castlevania series. 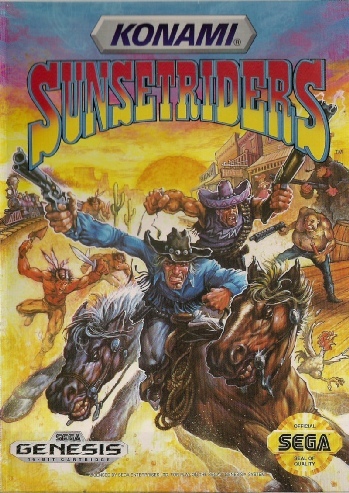 Sunset Riders| Konami| 1993| One of the artist’s personal favourites. 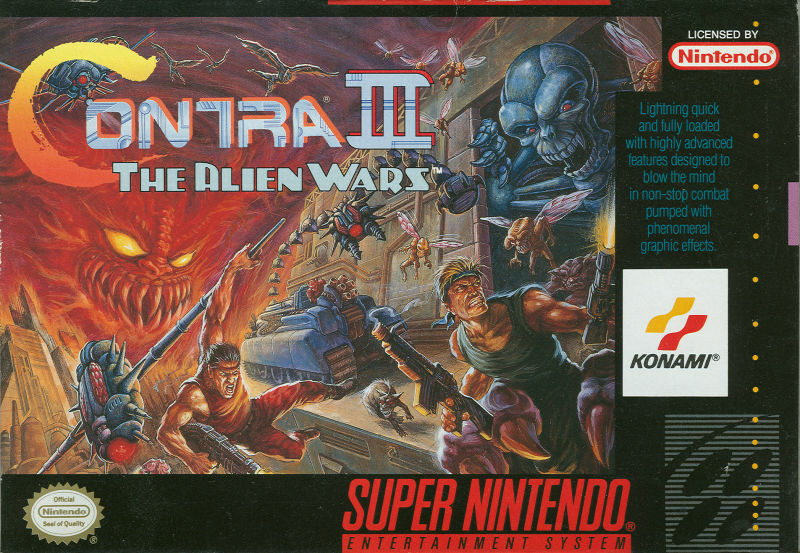 Contra III: The Alien Wars| Konami| 1992. Adam would like to thank Tom for all of his input and help on this article. The BOX=ART Tom Dubois interview came be found HERE. 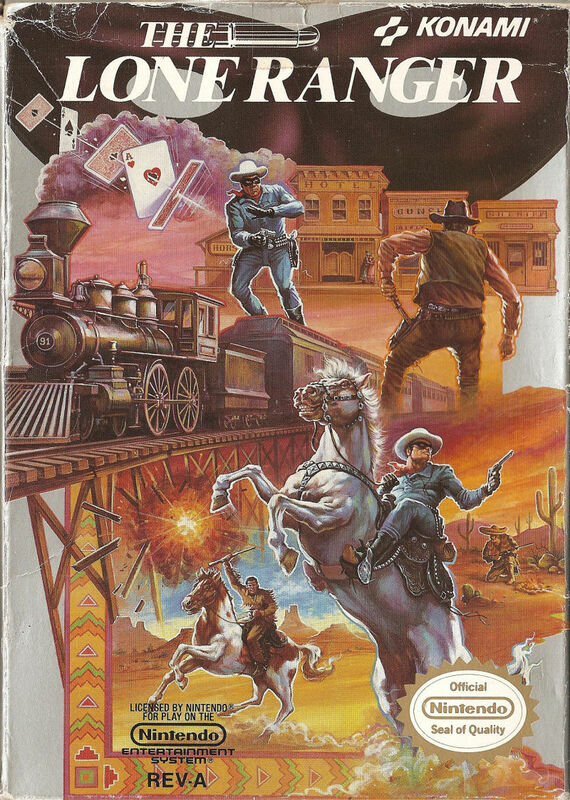 The Lone Ranger| Konami| 1991. Top Gun: Guts and Glory| Konami| 1993.